Some AK parts and accessories are sold for either stamped receivers or milled receivers, and are not interchangeable between the two, so we often get asked: "How do I know whether I have a stamped receiver or a milled receiver?" The short answer of course, is, "Look at it." But that's unhelpful. The difference is in the method of production. The original AK-47s that Kalashnikov built had milled receivers-- the receivers were machined (milled, as in on a milling machine) from a solid block of steel. 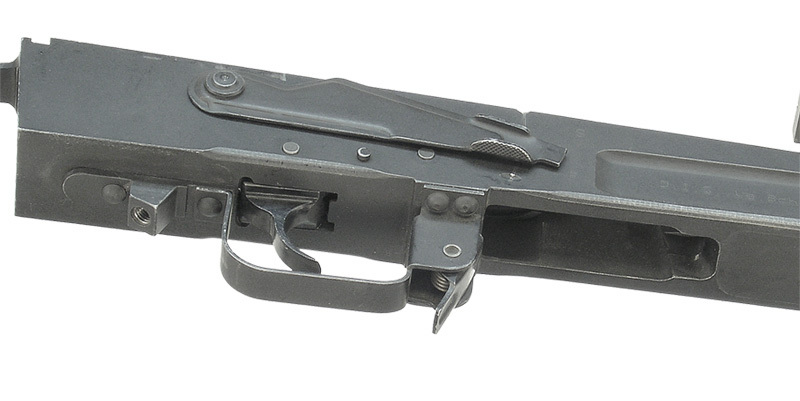 All the internal guide rails, magazine well and latch surfaces, bolt locking surfaces, bolt carrier stop, and the barrel and buttstock receiving sockets, were cut into the same, single piece of steel. Hence the milled receiver results in a lot of wasted steel, it costs more in terms of machine time, and its a bit heavier. Milled receivers can have one or two stock tangs (single tang receiver shown). The Milled receiver (above) is one piece of steel. Though you see the trigger and hammer axle pins, and a protruding stop pin for the safety/selector lever, there are no rivet heads protruding from the sides of the milled receiver. There is a large, rectangular-shaped cut for the purpose of weight reduction (lightening cut) above and in front of the magazine well. The trigger guard is stamped, and is riveted onto the bottom of the receiver in much the same way as on a stamped receiver, but the pistol grip nut is attached to the milled receiver (pistol grips are usually interchangeable between receiver types). Instead of a large lightening cut, you see a smaller, more rounded dimple just above the magazine. These form the internal magazine well surfaces that keep the magazine centered in the rifle. 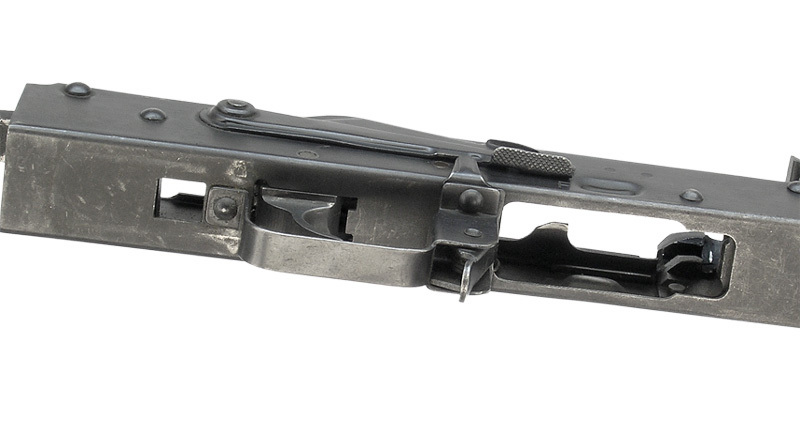 The lower bolt-guide rails, including the ejector (which is clearly visible through the mag well below) are separate stampings that are spot-welded into each side of the receiver. In the first of these two photos you can see two of these spot welds just above the side dimple, but they are not always visible, depending on the type and quality of the finish. The trigger guard is very similar to that of a milled receiver. The grip nut (not shown) is a separate small piece that fits down from inside the receiver through the square hole behind the trigger guard. As you now see, there can be no mistaking the two AK receiver types. In the small photo of the complete AK at the top of this page next to the UltiMAK logo, you can clearly see the rivet heads and the smaller, rounded dimple above the magazine-- obviously a stamped receiver. Both receiver types come in a number of variations, but these shown are among the most common in the U.S.. According to Soviet manuals, the AKM, with its stamped receiver, has a longer life expectancy in terms of rounds fired.